I’m no stranger to party planning. 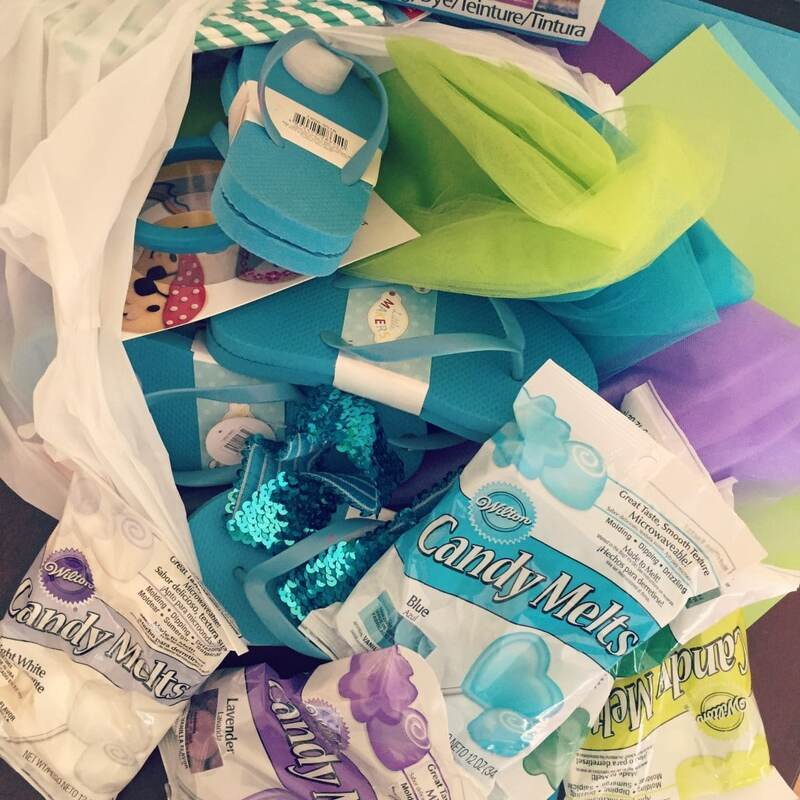 Even so, over the past few years, throwing big, elaborate, Pinterest-worthy shindigs (like this Sweet Shop party or this CAKE party or my all time favorite, this Beachy Mermaid party) has become less and less of a priority for me. 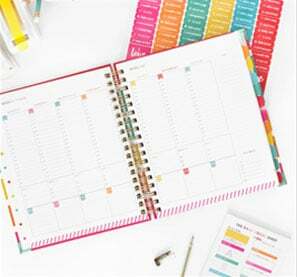 Don’t get me wrong–I still love having people over, but more often than not our get-togethers these days are impromptu, last-minute affairs with little fuss, marked by loud, wet kids and takeout pizza or Chinese food. One of the main reasons for this shift, other than being busy, is that as our girls have gotten older, we have begun giving them a choice between having a party or going away somewhere for a few days. More often than not, they choose the trip, so I was not at all surprised this year when my youngest, Annie, told me that she again wanted to go visit Miss Edie for her birthday. Since Annie’s birthday always falls right on or around Memorial Day, it is actually great weekend to go away. Thus, I called Edie and asked if we could come for a visit, but Edie surprised me by asking if she and her girls could come visit us this time instead. 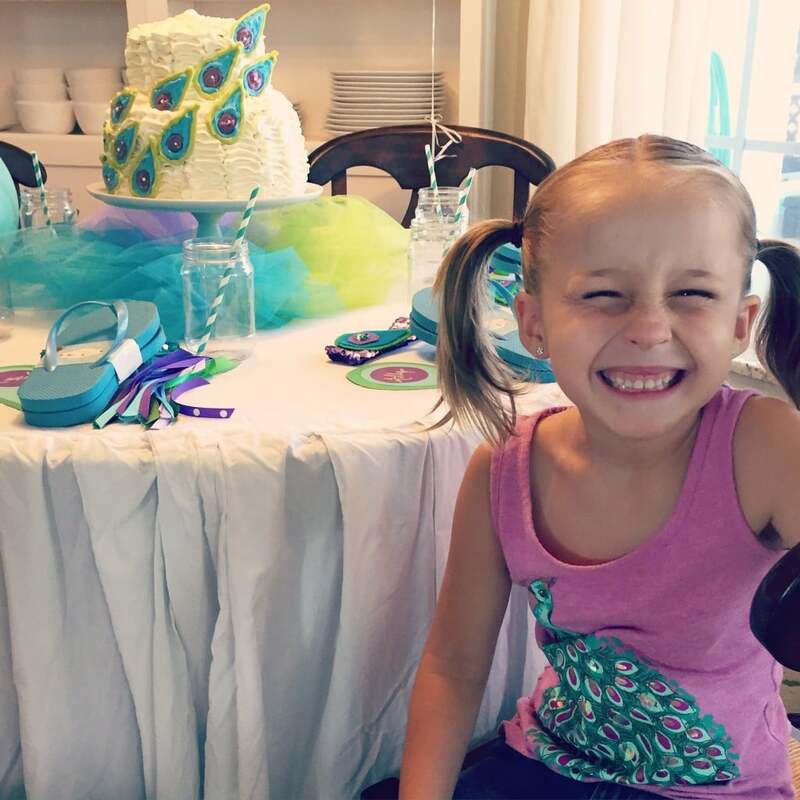 But then, just two days before her big day, she crawled in to my lap, put her arms around my neck, looked at me with her big blue eyes, and very sweetly said, “Mommy, can I please, please have a Peacock Party? Pretty please?” If you have ever met Annie, you know that that girl simply oozes with charm and personality, and that when she turns it on, she is nearly impossible to resist. I explained that Memorial Day weekend and that most people were probably already busy, but that I would see what I could do. 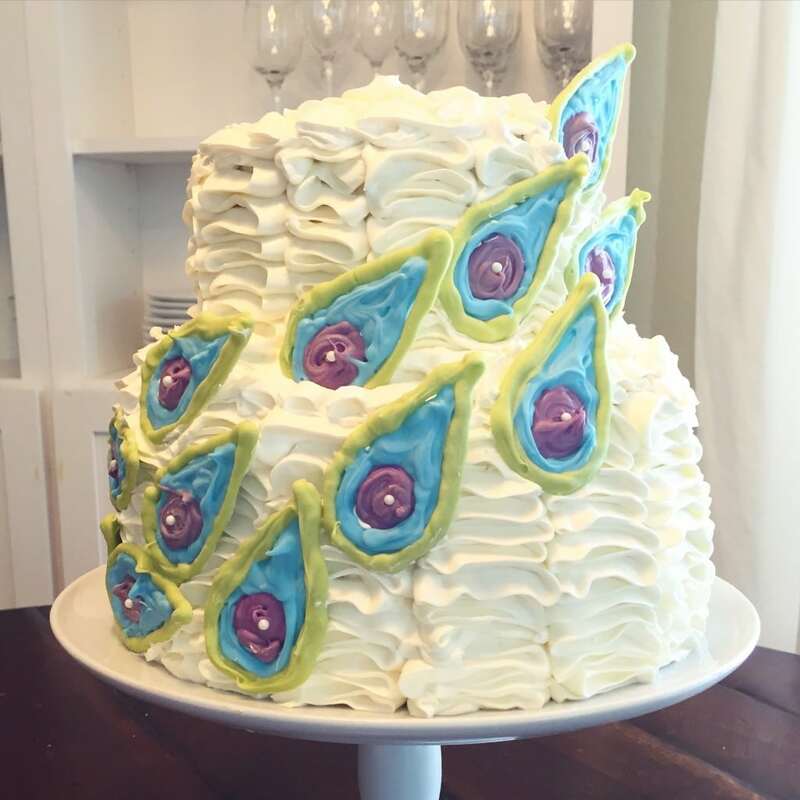 At the very least, I promised to make her a peacock cake. (Side note–Annie has been obsessed with peacocks for a while now–we have no idea why.) And with that, we had less than 48 hours to invite the guests, bake a cake, plan the decorations, come up with an activity or two, plan the menu, prepare the food, and stick to a budget of less than $150. It was going to be a crazy couple of days, but with no plans for the weekend, I was up for the challenge. Without a clear vision in mind, my first step was to head to JoAnns to gather a few basic supplies. 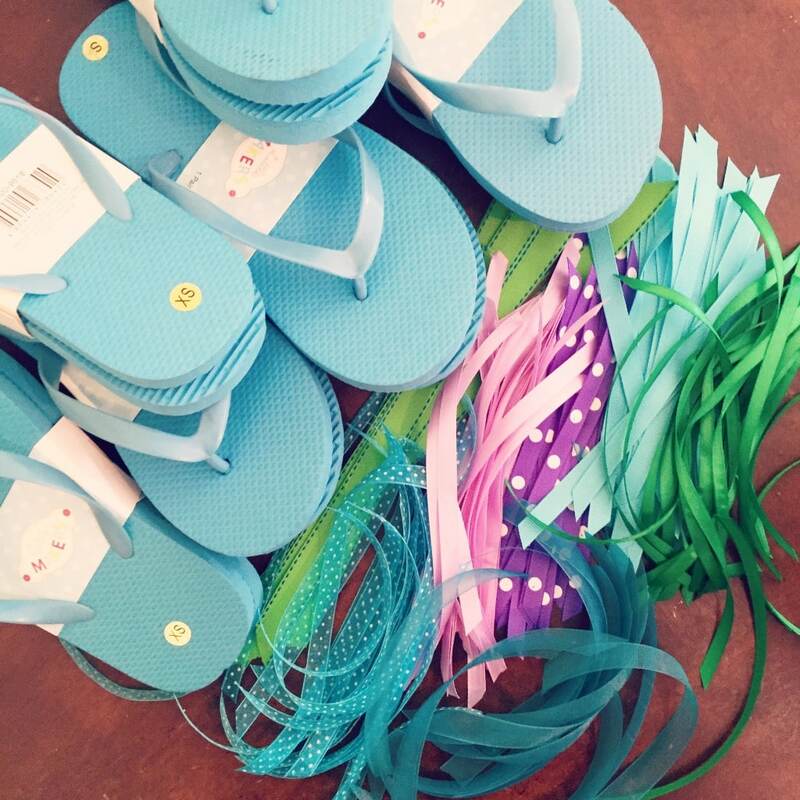 Luckily the holiday weekend meant they were having a great sale, and I managed to pick up some flip flops, ribbon, sequined headbands, scrapbook paper, candy melts, and tulle–all in shades of green, blue, & purple–for around $40 after using a 20% off coupon I was able to pull up on my phone. I also swung by Publix to pick up the ingredients for the 7 layer salad I had already been planning to try this weekend, as well as some Jello and cake mix, spending about $25. From the store, I texted the mom of one of Annie’s classmates, asking if there was any time she might be free on Monday. She said early afternoon. I decided to set the party time for 11am. 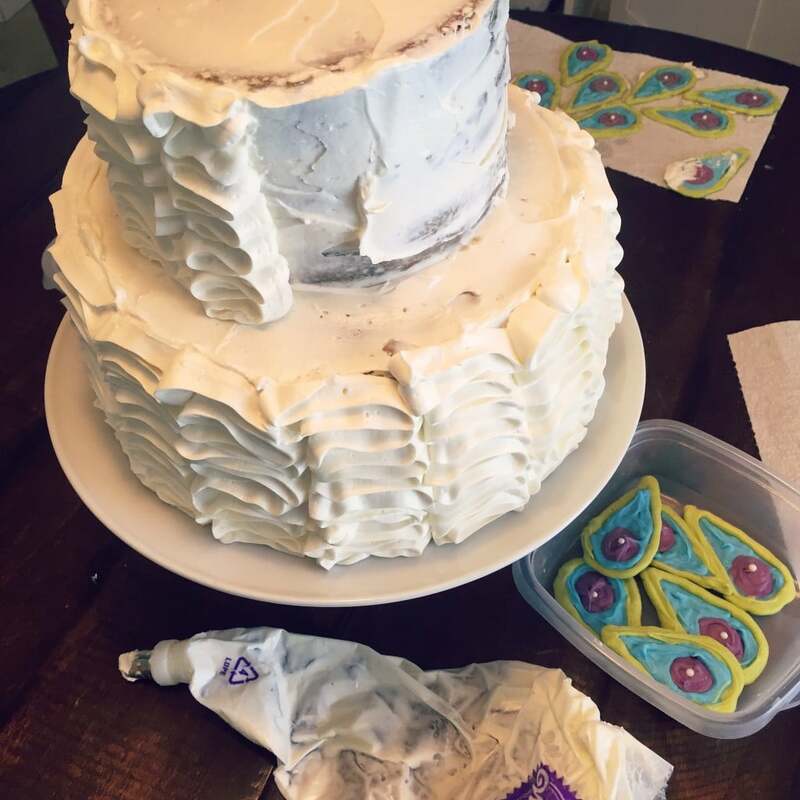 Knowing the cake was going to be the most complicated part of this whole process, I decided to work on that project first. 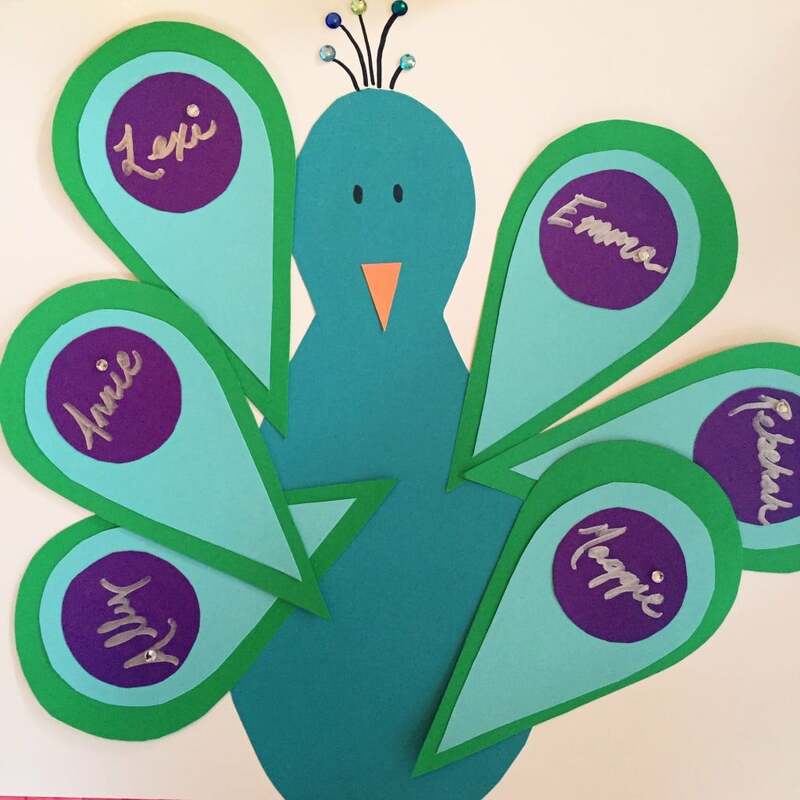 I first created a template out of card stock for the peacock features, then drew them onto a piece of paper and taped wax paper overtop. 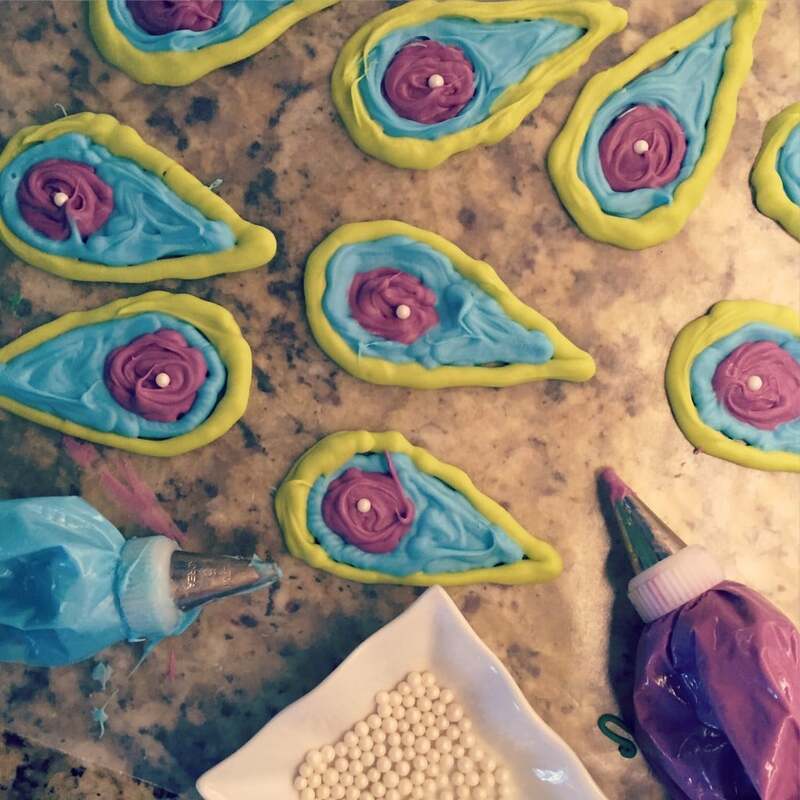 I then melted my lime green, aqua blue, & purple candy melts and piped them onto the wax paper. This process was a bit of a fiasco, partially because I forgot to buy more Wilton decorating bags and had to use Ziploc bags instead, which don’t work nearly as well, and partially because the tips kept getting jammed. In the end, they didn’t turn out quite as smooth as I had envisioned, but perfection is overrated and I really had no choice but to keep going! After finishing the candy feathers (and cleaning up the huge mess left behind! ), I quickly whipped up the first layer of Jello (purple) for the Jello salad. 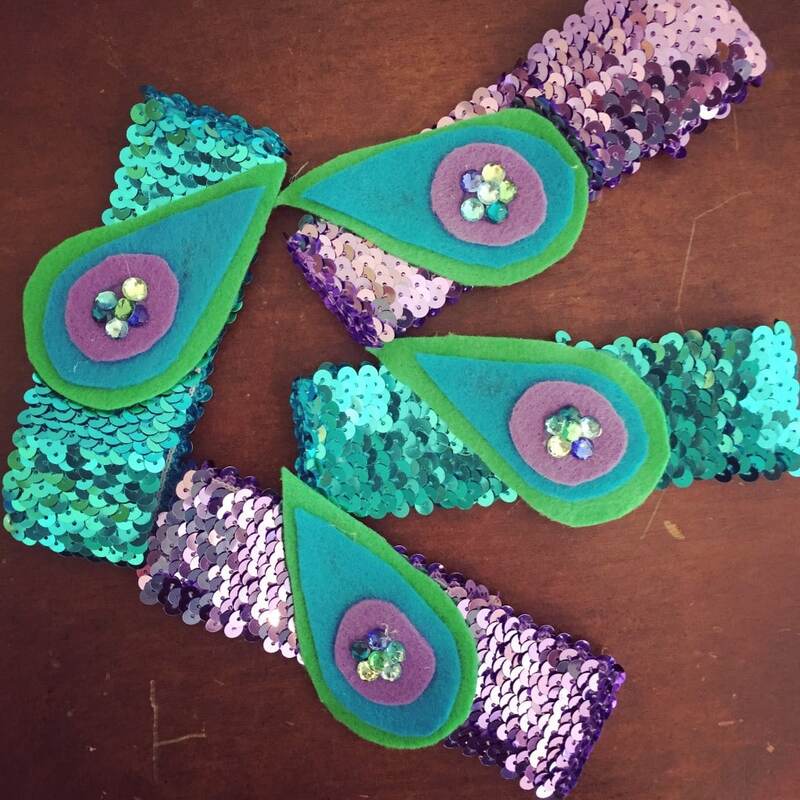 Using the same peacock feather templates, I cut the shapes out of some felt scraps I already had on hand & hot-glued them to the sequined headbands I had found in the dollar bin at the craft store. This was a pretty easy project! I began searching through the freezer & pantry to see what we could serve along with the Jello and 7-Layer Salad. 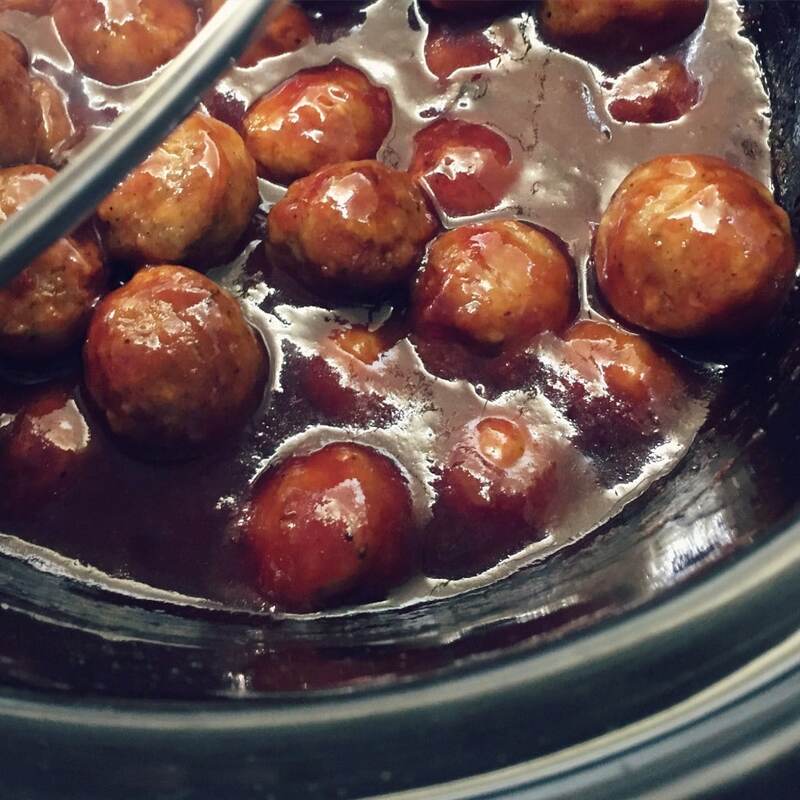 Chuck suggested Grape Jelly Meatballs–one of our go-to party staples–and I was happy to see we already had all the ingredients on hand. We also had quite a few different freezer meals on hand, including Greek Chicken, Sweet & Spicy Chicken, & Thai Chicken, as well as the steak from these Grilled Steak Tacos. We decided that we would serve a smorgasbord of grilled meats along with our favorite Cheesy Potato Casserole, and call it good. We also continued contacting a few friends to see if they could join us. 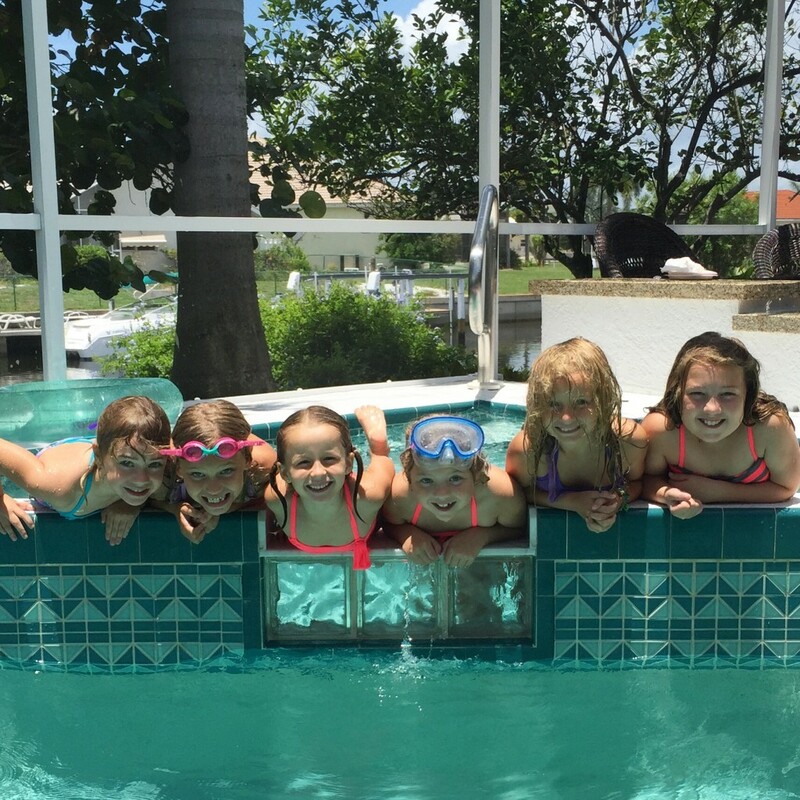 Amazingly enough, everyone we asked said yes, and we ended with a total guest count of 6 girls and 15 adults. I was up early to start working on the cake, which I knew was going to be an ordeal. Annie had requested chocolate, but after searching Pinterest for inspiration, I was eager to try my hand at a swirl cake. I decided to give her the best of both worlds, and layer chocolate with vanilla rainbow swirl. 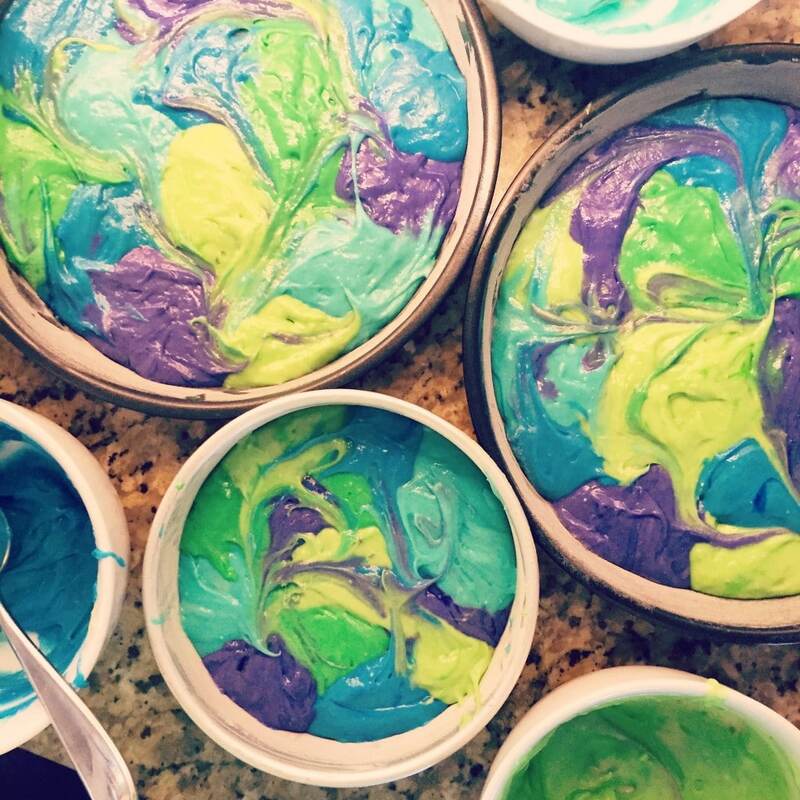 To make the swirl cake, I mixed up two boxes of vanilla cake mix per the box directions, then divided the batter into 5 bowls, adding a different shade of food coloring to each bowl. I then dropped random spoonfuls of the different colors into my greased and floured pans (a 9″ & 6″ round), baked them, inverted the cakes onto a cooling rack, then washed the pans and filled the pans again with the remaining batter. After the vanilla layers were finished, I baked the chocolate layers. 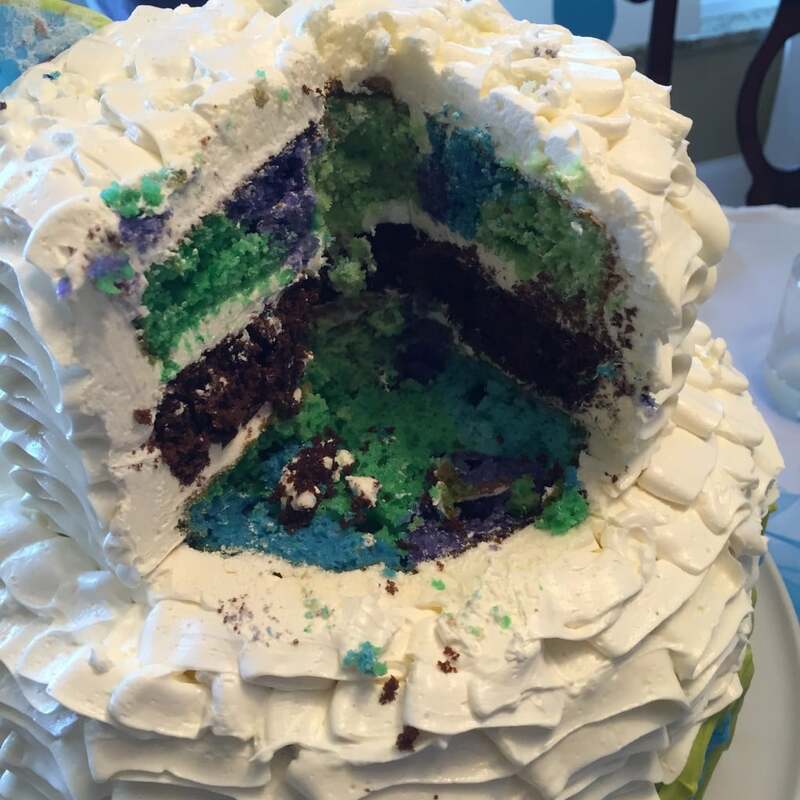 Somewhere in there, I also made the 2nd (blue) layer of the Jello salad. With all the cake layers baked and cooling, I started on the frosting. I knew I wanted to use a ruffle technique I’ve done several times before. It looks complicated but it is actually not hard at all. However, the Swiss Merengue Buttercream frosting it requires is a little more time consuming than other frosting recipes, as you must separate the eggs, then melt the sugar into the egg yolks over a double boiler, all while stirring constantly, and then whip the yolks for 10-12 minutes until they have completely cooled and until stiff peaks form, at which point you add the butter. I didn’t mind doing it once, but I was a little annoyed at myself for not making enough. With just a 1/4 of the cake left to go, I ran out of frosting and had to start the whole process over again. All in all, it was a pretty minor setback. At some point Chuck headed back to the store to pick up the ingredients for the cheesy potatoes, as well as more eggs and more butter, and one of those DIY helium tanks for the balloons, spending around $45. With the cake finally out of the way, the rest of the party seemed like a, well, piece of cake! The girls helped me prep the ribbons for the flip flops, then helped me create the tail feather name cards, which would also double as the tails for the “Pin the Tail on the Peacock game.” I also made the third (green) layer of the Jello salad. With little left to do but prepare the food and blow up balloons–both of which would have to wait until morning, I decided to set the kids’ table. 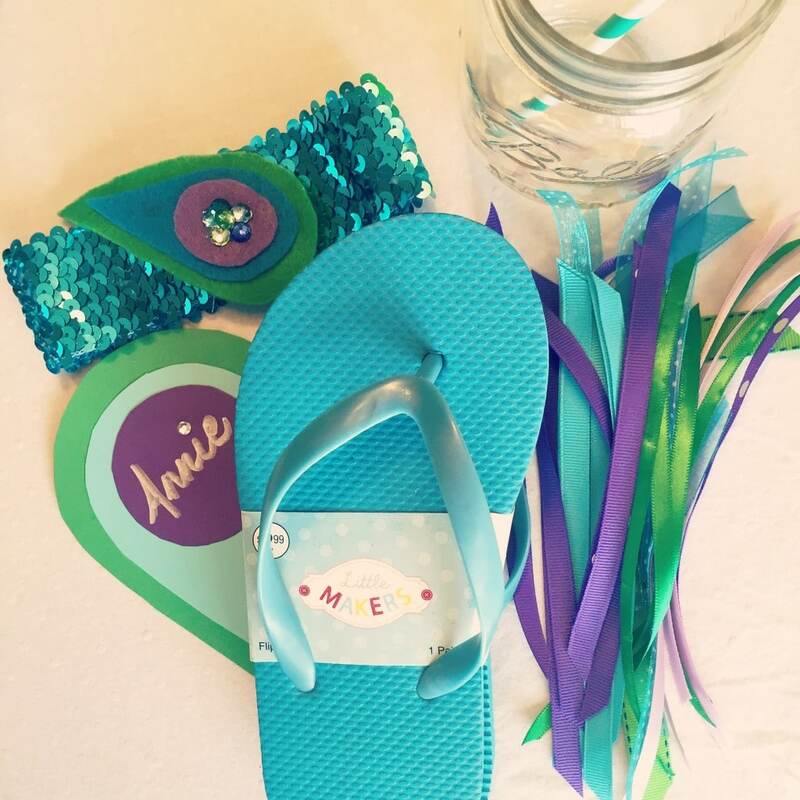 I used a white tablecloth I made a couple of years ago (using Edie’s tutorial), bunched some tulle in the center, and put the flip flops, headbands, and name cards at each place. Simple but cute! I was up early again, this time to get the meatballs into the crockpot. I also made a list of all the prep that needed to happen so that I would be sure to not forget anything. First on the list? A special breakfast of Dutch Babies for the birthday girl! With breakfast out of the way, I could finally set up the outside table with a white tablecloth & the remaining tulle. Pretty simple, but cute & festive! I got to work on the 7 layer salad, which was surprisingly easy to make. It looked so pretty! I prepped the cheesy potato casserole & set it aside to bake after the guest arrived. We set out our plastic “mason jar” party cups (purchased HERE years ago) with some cute aqua & white paper straws, and Chuck whipped up a big batch of homemade lemonade using the lemon juice we had frozen from our own lemon tree. 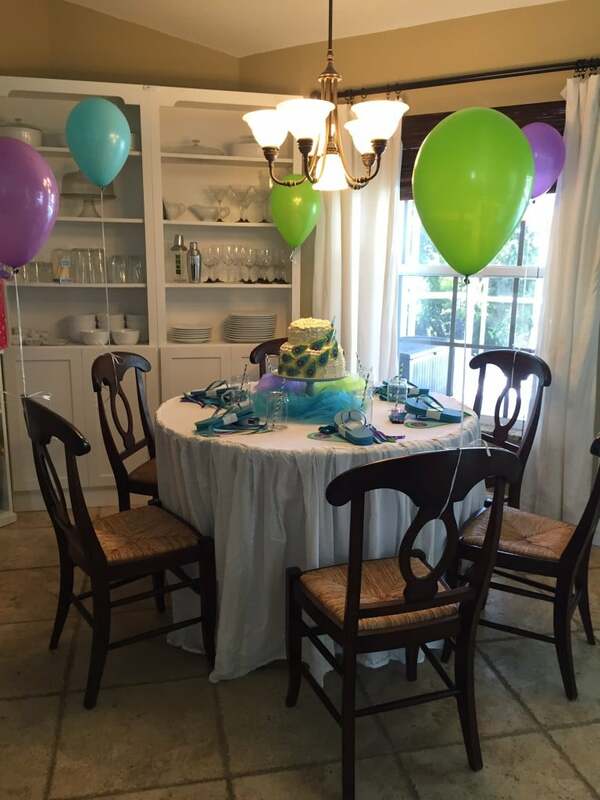 The girls helped me blow up the balloons–green, purple, & aqua, of course! I got myself dressed & ready, then helped the girls pick out their clothes and do their hair. I realized that I hadn’t thought about plates or silverware. Luckily I had a variety of disposable plates & cutlery on hand. They didn’t match at all, but oh well–perfection is overrated! I put the cake out on the table, and with 15 minutes to spare, we were ready to party! The party itself, I’m happy to say, went off without a hitch and came in well under budget. The food, despite being a random sampling of our freezer meals, was a hit. 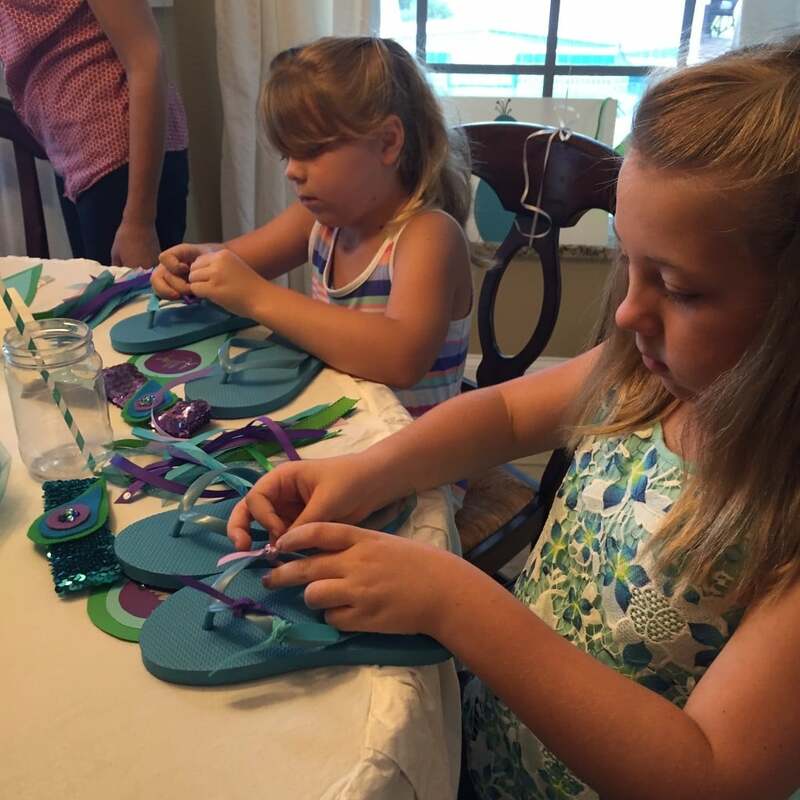 The kids had fun making their flip flops and everyone loved the cake–the colorful inside was met with lots of oohs and aahs!! All the kids inevitably ended up in the pool and Chuck and I had a blast getting to spend time with friends we don’t see nearly enough. When it was all over, we were exhausted, but only in the best possible way. In the end, I think there were a few key elements that made it possible for us to pull off a fun, budget-friendly party in just two days. First, I’ve thrown LOTS of parties before. I already had all the basic supplies–tablecloths, cups, drink dispenser, etc.–on hand, so I didnt have to spend time or money worrying about them. Second, we had the whole weekend free to focus 100% on making it happen–there were no distractions, just pure party prep for 48 hours straight. Third, I wasn’t worried about having everything be perfect. Because it was such short notice, I knew my guests wouldn’t be expecting all that much. If something went wrong, it wouldn’t be that big of a deal. As long as Annie was happy and the guests had fun, it would be a win. And it was! This is amazing! I’m very impressed that you were able to throw such a detailed, nice party on such limited time. 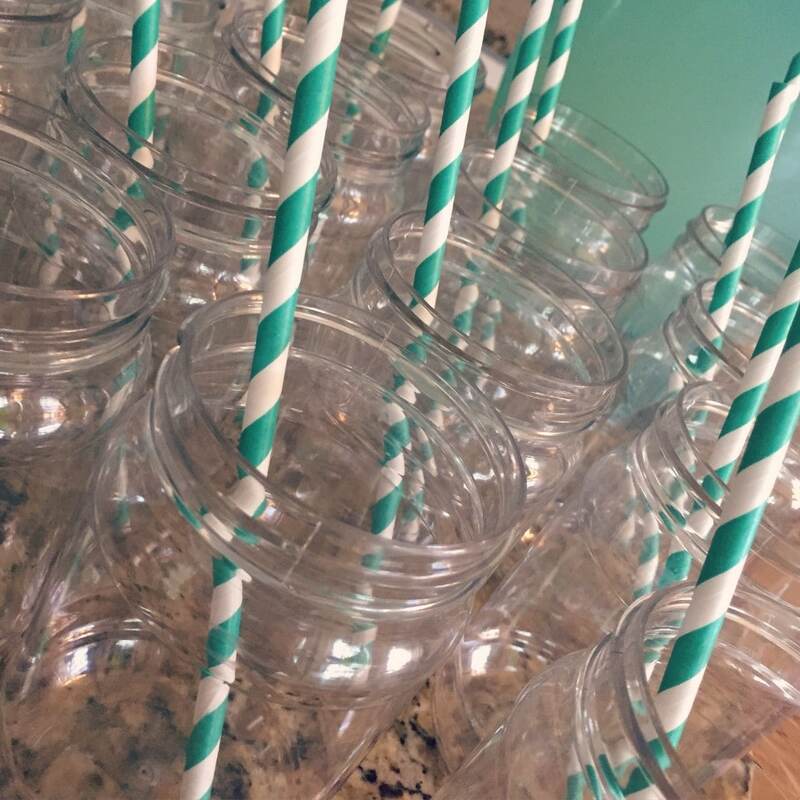 I’m currently planning my son’s first birthday party, and I love your idea of plastic mason jars. I can’t seem to find any on that site that look like ones you can drink from, they look more like storage containers. Do you mind sharing the details on the specific glasses you purchased? Thank you! Holy Awesomeness! This is great! 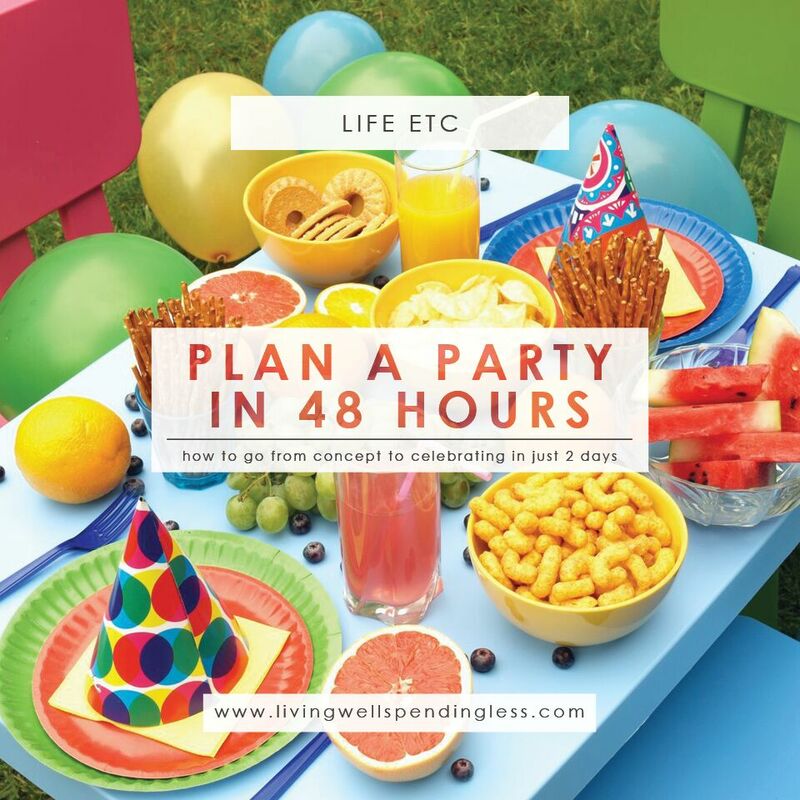 I hope I never have to plan a party in 48 hours, but if I do you know I will be stealing some of these ideas!! Great job! My seven year old said “oooooohhhhh preeeeettty!” about that cake. I don’t mind when I have little imperfections (or big ones like the rock candy sticks that knocked out the back of my Frozen cake at my daughter’s 5th bday party!). It’s so fun to make these things and I think they will have great memories of those special cakes mommy made. She’s grown a lot! I started reading your blog 2 years ago, when I found your videos about Extreme Couponing. She was a toddler! And what a colorful party! The headbands are fabulous! Awesome. 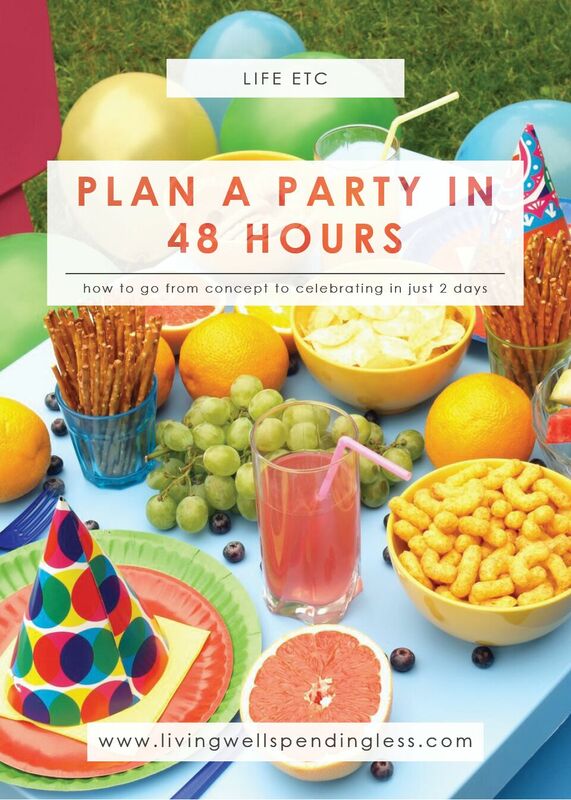 Great details on planning a party. 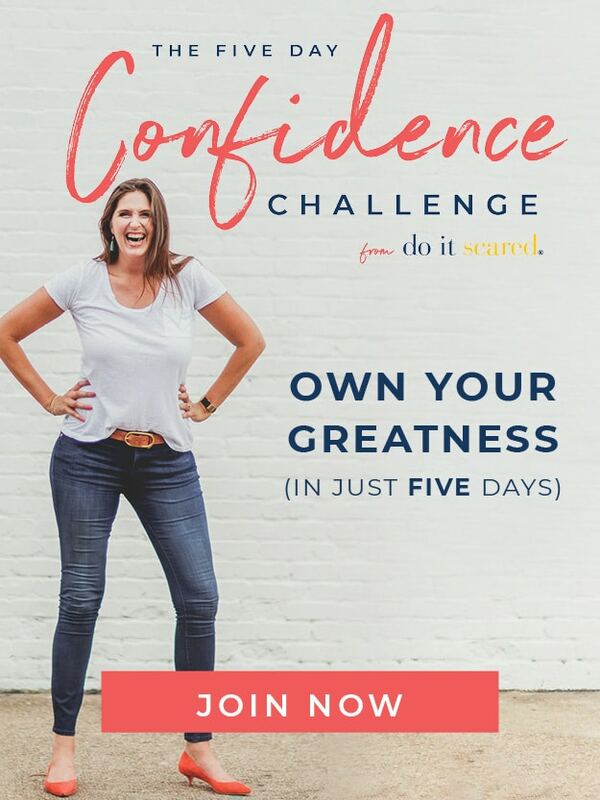 I never knew you can do all that within 48 hours. Love the details put into this post. It’s a great idea for someone of any age. I think that it’s a tutorial for adults, of course, but a kid could make their own variations! I hope your daughter had a great time with her friends!